Why the name Interact? It's derived from "international"and "action" which reflects the character of this world-wide organisation that exists in 109 countries with more than 10,700 clubs involving at least 246,000 Interactors. 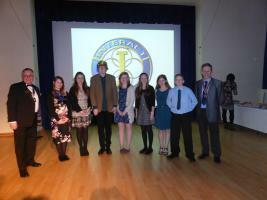 Interact Clubs are charged to undertake two projects: one based in their local community and one internationally focused. Photos below : Left Rossendale Explorers Interact Club sponsored by the Rotary Club of Bacup having fun trying to erect a shelter box tent but finding it a bit harder than they thought. 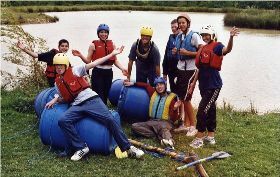 Right : Water sports in Wales - many Interactors from all over Britain get together for a weekend in the summer. It is called the Interact Multi District Rally or IMDR for short. A superb opportunity to link up with young people from other Districts. Your Interact Club can be either school or community based; it will be self-governing and self-supporting but will have a sponsoring Rotary Club with an enthusiastic Rotarian acting as a link. You will also need a link adult within your Interact Club eg: member of school staff or a scout leader, who understands & appreciates the value of having such a Club. What's in it for young people? Fun, fellowship, developing life skills and meeting new people! The school curriculum has stated for some time that students need to participate in community activities; an Interact Club is heaven- sent for fulfilling this requirement. The Duke of Edinburgh Awards and the Baccalaureate also ask for community hours. Interactors enjoy deciding their own two programmes which will be supported by their sponsoring Rotary Club & therefore have added value. Because an Interact Club is so much more than an ordinary youth club it should conduct business meetings at least once a month with the emphasis on short and sweet as the majority of the time spent together as a group will be on their social programme and their chosen projects. Nevertheless, the election of Club Officers such as President, President Elect, Treasurer, Secretary, Public Relations Officers and committee chairmen will guarantee the feeling of inclusion and involvement as well as proper accountability. This will develop leadership skills, organisational skills, team work, a sense of service as well as individual responsibility. Another activity could include designing headed paper to use for correspondence. What's in it for teachers, scout leaders, youth leaders? Interact Clubs can enhance the curriculum and the leisure hours of young people by developing citizenship, global awareness, communication skills and enquiry. This sharpened sense of focus would be recognised by both parents and Ofsted Inspectors. A certificate stating that the young person belongs to such a Club could be a very useful addition in their Achievement Folder, perhaps providing a useful subject to discuss at an interview for university or a job, as a seventeen year old Fleetwood Interactor told me. What's in it for Rotarians? It's fun to work with young people - and - it keeps us young in the process! It gives Rotary Clubs the opportunity to build positive relationships with the other adults involved with these young people. It provides another opportunity for Service and will open up even more links with the local community so it would be mutually beneficial. Interactors can be identified as candidates for other Rotary Youth Programmes. In 2005 Rotary celebrated its first centenary. The successful engagement of young people with what we do guarantees we will celebrate the second, even though you & I will be long gone!